It works because all concerned seem to have taken the premise seriously, and the intention to give all the material the same degree of concentration and finish has paid off. The orchestral arrangements by Ben Parry and Jonathan Rathbone are modern and sympathetic, sometimes lush, without seeming out of place or stylistically wrong. Guitarist Rufus Miller, who as a session player has worked with bands such as the Sleaze and Sting, here seems to play mainly an acoustic guitar (or something close) and the arrangements that he has made with Matthew Long are sympathetically intriguing and rather imaginative. In fact, you could have imagined a whole disc of them on their own. The songs performed with Malcolm Martineau are all finely done. Matthew Long has a fine-grained lyric voice which suits this repertoire. He combines a fine lyric line, with feeling of the words. It is clearly not a large instrument, but he uses it intelligently and his performances are frequently affecting. The choices of the composed songs are not always obvious, Holst's The Thought, for instance, is edgy and positively aphoristic. In fact, it is Matthew Long's voice which is at the centre of all this music. He seems to bring that same combination of fine lyric line, beauty of tone and intelligence to all the music, singing Jerusalem and The Last Rose of Summer as beautifully as Butterworth's Loveliest of Trees. 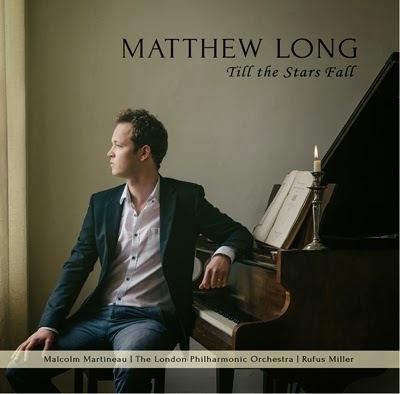 And in the larger orchestral arrangements, Matthew Long does not try to be anything other than what he is, singing with admirable straight directness, and it is to Ben Parry and Jonathan Rathbone's credits that they have crafted orchestrations which set Matthew Long's voice off, rather than trying to pretend that it is something that it is not. This is the least poppy cross-over album that I have heard in a long time. Whilst I would not want to hear a whole disc of the orchestral arrangements of songs like I vow to thee my country, Jerusalem and O Danny Boy, in the context of this set they work well. The disc generally alternates the three strands (orchestra, piano, guitar) in an attractive and intelligent way. And it does throw up some interesting links when you hear songs by Finzi and Quilter, performed alongside both folk-songs and the more traditional popular songs. A finely crafted performance of O Danny Boy, with the London Philharmonic Orchestra, is followed by a performance of RVW's Tired (one of his four last songs to works by his wife Ursula) accompanied by Malcolm Martineau, and Matthew Long sings both with same beauty of tone, care and intelligent attention to the phrasing. This is why this set works. Do give this set a try, there is as much in it for the season recital goer as for those less familiar with the repertoire. Matthew Long at Abbey Road from Billy Boyd Cape on Vimeo.